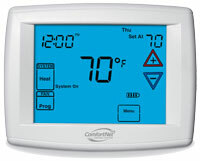 The Goodman® brand programmable and non-programmable commercial and residential digital thermostats work with Goodman brand heating and cooling systems, and are compatible with a variety of accessories. The Goodman brand ComfortNet digital control works with Goodman brand ECM-based furnaces and air handlers and 16 & 18 SEER two-stage air conditioners and heat pumps. 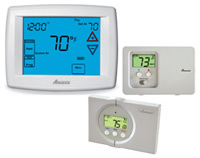 The Goodman® brand programmable and non- programmable residential digital thermostats work with Goodman brand heating and cooling systems, and are compatible with a variety of accessories.